Medal set belonging to Nursing Sister Ann Baillie (1888-1942), ARRC, who enlisted with the Canadian Army Medical Corps in 1915 and served overseas in Egypt and France as a member of No. 7 (Queen’s) General Hospital. This set includes, from left to right: the Royal Red Cross, Class 2 (ARRC) awarded on 1 January 1918; the 1914-1915 Star, the British War Medal 1914-1920, the Victory Medal 1914-1919 with an oak leaf cluster indicating a Mention-in-Despatches, the George V Silver Jubilee medal 1935. The original Order of the Royal Red Cross was instituted by Queen Victoria in 1883 as a Military Decoration “for special exertions in providing for the nursing of, or for attending to, sick and wounded soldiers and sailors.” By the start of the Great War, only 246 nurses had been deemed worthy of admission to the Order. First instituted on 10 November 1915, as subordinate level within the Order, the Royal Red Cross, Class 2 (ARRC) is imprinted on the reverse with the words “faith, hope, and charity,” and was available only to nurses. Four hundred and forty six ARRCs have been awarded to Canadian nurses over time. 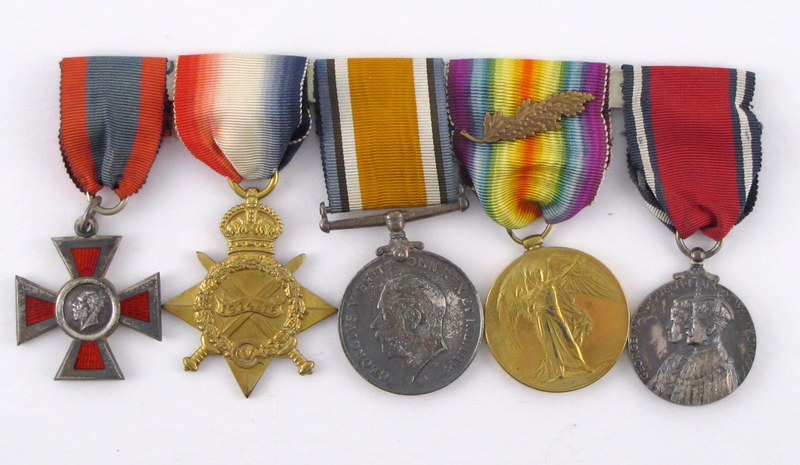 As a set of medals, those of Nursing Sister Ann Baillie are not unique, but are noteworthy-her ARRC and 1914-15 Star set her apart from many other Great War veterans whose medals are more likely to be the War Medal and the Victory Medal, possibly with a decoration for gallantry and/or leadership. Her Silver Jubilee Medal was probably awarded for her services to Nursing at the Kingston General Hospital. A graduate of the Kingston General Hospital School of Nursing in 1910, Ann Baillie was later superintendent of the training school from 1924 until her death in 1942. The nurses’ residence at KGH was later renamed in her honour and is now designated a National Historic Site symbolizing the development and recognition of nursing as a profession. The building is also the home of the Museum of Health Care at Kingston.